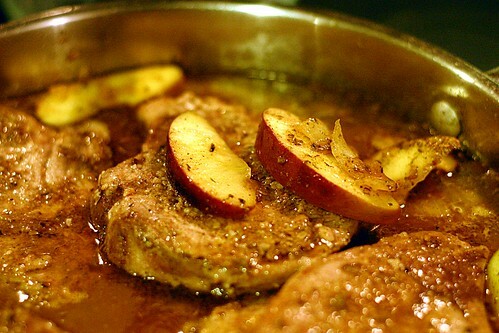 Steve and I were shopping for groceries the other day and I found a packet of spices for Apple And Sage Pork Chops. Usually, I don’t notice those little packets, but this one caught my attention. You can see what I’m talking about at the McCormick recipes website. So, I brought the spices open, thawed out some pork chops — and realized that I needed to double the recipe to feed everyone in the family. Fortunately, I already had all the spices the recipe called for. 1. I mixed the flour, spices and salt in small bowl. Then sprinkled each sides of pork chops with a pinch of the seasoned flour. 2. 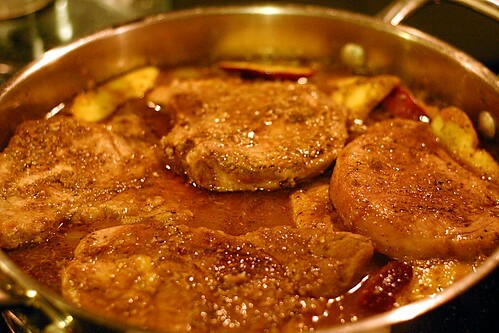 Then I cooked the pork chops in hot olive oil in large skillet on medium high heat until they were browned on both sides. I removed the chops from the skillet and put them on a plate to rest. I then added the onion to the skillet, cooked and stirred for 3 minutes or until tender. Then I added the apples and cooked and stirred them for three minutes. 3. Once I completed those steps, I stirred in the juice, sugar and the rest of the flour/seasoning mix, until they were well blended. Then I returned the pork chops to the skillet and brought the mixture to a boil. I reduced the heat to low and simmered for 10 minutes. Yummy!!!!!!! That looks good enough to eat!!!!!! I hope you know you’ll have to fix that the next time yall come to visit.